Respiration is the process by which living organisms take in oxygen and release carbon dioxide. The human respiratory system, working in conjunction with the circulatory system, supplies oxygen to the body's cells, removing carbon dioxide in the process. The human respiratory system is a series of organs responsible for taking in oxygen and expelling carbon dioxide. 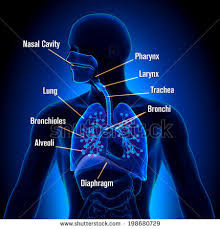 The primary organs of the human respiratory system are lungs, which carry out this exchange of gases as we breathe.Red blood cells collect the oxygen from the lungs and carry it to the parts of the body where it is needed, according to theAmerican Lung Association. During the process, the red blood cells collect the carbon dioxide and transport it back to the lungs, where it leaves the body when we exhale.The human body needs oxygen to sustain itself. A decrease in oxygen is known as hypoxia and acomplete lack of oxygen is known as anoxia and,according toMedLine Plus. These conditions can be fatal; after about four minutes without oxygen, brain cells begin dying, according toNYU Langone Medical Center, which can lead to brain damage and ultimately death.In humans, the average rate of breathing is dependent upon age. A newborn's normal breathing rate is about 40 times each minute and may slow to 20 to 40 times per minute whenthe baby is sleeping, according to theChildren's Hospital of Philadelphia.For adults, the average resting respiratory rate for adults is 12 to 16 breaths per minute, according toJohns Hopkins Medicine. Physical exertion also has an effect on respiratory rate, and healthy adults can average 45 breaths per minute during strenuous exercise.Parts of the respiratory systemAs we breathe, oxygen enters the nose or mouth and passes the sinuses, which are hollow spaces in the skull. Sinuses help regulate the temperature and humidity of the air we breathe.The trachea, also called the windpipe, filters the air that is inhaled, according to the American Lung Association. It branches into the bronchi, which are two tubes that carry air into each lung. The bronchial tubes are lined with tiny hairs called cilia. Cilia move back and forth, carrying mucus up and out. Mucus, asticky fluid, collects dust, germs and other matter that has invaded the lungs. We expel mucus when we sneeze, cough, spit or swallow.The bronchial tubes lead to the lobes of the lungs. The right lung has three lobes; the left lung has two, according to the American Lung Association. The left lung is smaller to allow room for the heart, according to theNational Heart, Lung and Blood Institute(NHLBI). Lobes are filled with small, spongy sacs called alveoli, and this is where the exchange of oxygen and carbon dioxide occurs.The alveolar walls are extremely thin (about 0.2 micrometers). These walls are composed of a single layer of tissues called epithelial cells and tiny blood vessels called pulmonary capillaries.Blood passes through the capillaries. The pulmonary artery carries blood containing carbondioxide to the air sacs, where the gas moves fromthe blood to the air, according to the NHLBI. Oxygenated blood goes to the heart through the pulmonary vein, and the heart pumps it throughout the body.The diaphragm, a dome-shaped muscle at the bottom of the lungs, controls breathing and separates the chest cavity from the abdominal cavity, the American Lung Association noted. When a breath it taken, it flattens out and pullsforward, making more space for the lungs. During exhalation, the diaphragm expands andforces air out. Respiration is the process by which living organisms take in oxygen and release carbon dioxide. The human respiratory system, workingin conjunction with the circulatory system, supplies oxygen to the body's cells, removing carbon dioxide in the process. The exchange of these gases occurs across cell membranes both in the lungs (external respiration) and in the bodytissues (internal respiration). Breathing, or pulmonary ventilation, describes the process of inhaling and exhaling air. 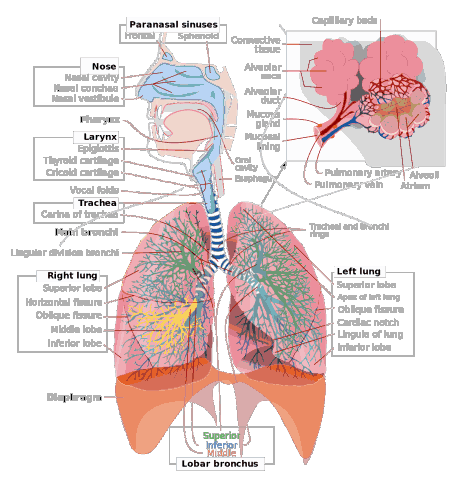 The human respiratory system consists of the respiratory tractand the lungs. The respiratory tract cleans, warms, and moistens air during its trip to the lungs. The tract can be divided into an upper and a lower part. The upper part consists of the nose, nasal cavity, pharynx (throat), and larynx (voice box). The lower part consists of the trachea (windpipe), bronchi, and bronchial tree.The nose has openings to the outside that allowair to enter. Hairs inside the nose trap dirt andkeep it out of the respiratory tract. The external nose leads to a large cavity within the skull, the nasal cavity. This cavity is lined with mucous membrane and fine hairs called cilia. Mucus moistens the incoming air and traps dust. The cilia move pieces of the mucus with its trapped particles to the throat, where it is spit out or swallowed. Stomach acids destroy bacteria in swallowed mucus. Blood vessels in the nose and nasal cavity release heat and warm the entering air.Air leaves the nasal cavity and enters the pharynx. From there it passes into the larynx, which is supported by a framework of cartilage (tough, white connective tissue). The larynx is covered by the epiglottis, a flap of elastic cartilage that moves up and down like a trap door. The epiglottis stays open during breathing, but closes during swallowing. This valve mechanism keeps solid particles (food) and liquids out of the trachea. If something other than air enters the trachea, it is expelled through automatic coughing.Words to KnowAlveoli:Tiny air-filled sacs in the lungs where the exchange of oxygen and carbon dioxide occurs between the lungs and the bloodstream.Bronchi:Two main branches of the trachea leading into the lungs.Bronchial tree:Branching, air-conducting subdivisions of the bronchi in the lungs.Diaphragm:Dome-shaped sheet of muscle located below the lungs separating the thoracic and abdominal cavities that contracts and expands to force air in and out of the lungs.Epiglottis:Flap of elastic cartilage covering the larynx that allows air to pass through the trachea while keeping solid particles and liquids out.Pleura:Membranous sac that envelops each lung and lines the thoracic cavity.Air enters the trachea in the neck. Mucous membrane lines the trachea and C-shaped cartilage rings reinforce its walls. Elastic fibers in the trachea walls allow the airways to expand and contract during breathing, while the cartilage rings prevent them from collapsing. The trachea divides behind the sternum (breastbone) to form a left and right branch, called bronchi (pronounced BRONG-key), each entering a lung.The lungsThe lungs are two cone-shaped organs located in the chest or thoracic cavity. The heart separates them. The right lung is somewhat larger than the left. A sac, called the pleura, surrounds and protects the lungs. One layer of the pleura attaches to the wall of the thoracic cavity and the other layer encloses the lungs. Afluid between the two membrane layers reduces friction and allows smooth movement of the lungs during breathing.The lungs are divided into lobes, each one of which receives its own bronchial branch. Inside the lungs, the bronchi subdivide repeatedly into smaller airways. Eventually they form tiny branches called terminalbronchioles. Terminal bronchioles have a diameter of about 0.02 inch (0.5 millimeter). This branching network within the lungs is called the bronchial tree.The terminal bronchioles enter cup-shaped air sacs called alveoli (pronounced al-VEE-o-leye). The average person has a total of about 700 million gas-filled alveoli in the lungs. These provide an enormous surface area for gas exchange. A network of capillaries (tiny blood vessels) surrounds each alveoli. As blood passes through these vessels and air fills the alveoli, the exchange of gases takes place: oxygen passes from the alveoli into the capillaries while carbon dioxide passes from thecapillaries into the alveoli.This process—external respiration—causes the blood to leave the lungs laden with oxygen andcleared of carbon dioxide. When this blood reaches the cells of the body, internal respiration takes place. The oxygen diffuses or passes into the tissue fluid, and then into the cells. At the same time, carbon dioxide in the cells diffuses into the tissue fluid and then intothe capillaries. The carbon dioxide-filled blood then returns to the lungs for another cycle. BreathingBreathing exchanges gases between the outside air and the alveoli of the lungs. Lung expansion is brought about by two important muscles, the diaphragm (pronounced DIE-a-fram) and the intercostal muscles. The diaphragm is a dome-shaped sheet of muscle located below the lungs that separates the thoracic and abdominal cavities. The intercostal muscles are located between the ribs.Nerves from the brain send impulses to the diaphragm and intercostal muscles, stimulatingthem to contract or relax. When the diaphragmcontracts, it moves down. The dome is flattened, and the size of the chest cavity is increased. When the intercostal muscles contract, the ribs move up and outward, which also increases the size of the chest cavity. By contracting, the diaphragm and intercostal muscles reduce the pressure inside the lungs relative to the pressure of the outside air. As a consequence, air rushes into the lungs during inhalation. During exhalation, the reverse occurs. The diaphragm relaxes and its dome curves up into the chest cavity, while the intercostal muscles relax and bring the ribs down and inward. The diminished size of the chest cavity increases the pressure in the lungs, thereby forcing air out.A healthy adult breathes in and out about 12 times per minute, but this rate changes with exercise and other factors. Total lung capacity is about 12.5 pints (6 liters). Under normal circumstances, humans inhale and exhale about one pint (475 milliliters) of air in each cycle.Only about three-quarters of this air reaches thealveoli. The rest of the air remains in the respiratory tract. Regardless of the volume of air breathed in and out, the lungs always retainabout 2.5 pints (1200 milliliters) of air. Thisresidual air keeps the alveoli and bronchioles partially filled at all times. External respiration is the exchange of gas between the air in the alveoli and the blood within the pulmonary capillaries. A normal rateof respiration is 12-25 breaths per minute. In external respiration, gases diffuse in either direction across the walls of the alveoli. Oxygen diffuses from the air into the blood and carbon dioxide diffuses out of the blood into the air. Most of the carbon dioxide is carried to the lungsin plasmaas bicarbonate ions (HCO3-). When blood enters the pulmonary capillaries, thebicarbonate ions and hydrogen ions are converted to carbonic acid (H2CO3) and then back into carbon dioxide (CO2) and water. This chemical reaction also uses up hydrogen ions. The removal of these ions gives the blood a moreneutral pH, allowing hemoglobin to bind up more oxygen. De-oxygenated blood "blue blood" coming from the pulmonary arteries, generally has an oxygen partial pressure (pp) of 40 mmHg and CO2 pp of 45 mmHg. Oxygenated blood leaving the lungs via the pulmonary veins has an O2 pp of 100 mmHg and CO2 pp of 40 mmHg. It should be noted that alveolar O2 pp is 105 mmHg, and not 100mmHg. The reason why pulmonary venous returnblood has a lower than expected O2 pp can be explained by "Ventilation Perfusion Mismatch". Lung CapacityThe normal volume moved in or out of the lungsduring quiet breathing is calledtidal volume. When we are in a relaxed state, only a small amount of air is brought in and out, about 500 mL. You can increase both the amount you inhale, and the amount you exhale, by breathing deeply. Breathing in very deeply isInspiratory Reserve Volumeand can increase lung volume by2900 mL, which is quite a bit more than the tidal volume of 500 mL. We can also increase expiration by contracting our thoracic and abdominal muscles. This is calledexpiratory reserve volumeand is about 1400 ml of air.Vital capacityis the total of tidal, inspiratory reserve and expiratory reserve volumes; it is calledvital capacity because it is vital for life, and themore air you can move, the better off you are. There are a number of illnesses that we will discuss later in the chapter that decrease vital capacity. Vital Capacity can vary a little depending on how much we can increase inspiration by expanding our chest and lungs. Some air that we breathe never even reaches the lungs! Instead it fills our nasal cavities, trachea,bronchi, and bronchioles. These passages aren't used in gas exchange so they are considered to bedead air space. To make sure that the inhaled air gets to the lungs, we need to breathe slowly and deeply. Even when we exhale deeply some air is still in the lungs,(about 1000 ml) and is calledresidual volume. This air isn't useful for gas exchange. There are certain types of diseasesof the lung where residual volume builds up because the person cannot fully empty the lungs. This means that the vital capacity is also reduced because their lungs are filled with uselessair.Stimulation of BreathingThere are two pathways of motor neuron stimulation of the respiratory muscles. The first is the control of voluntary breathing by the cerebral cortex. The second is involuntary breathing controlled by the medulla oblongata.There are chemoreceptors in the aorta, the carotid body of carotid arteries, and in the medulla oblongata of the brainstem that are sensitive to pH. As carbon dioxide levels increase there is a buildup of carbonic acid, which releases hydrogen ions and lowers pH. Thus, the chemoreceptors do not respond to changes in oxygen levels (which actually changemuch more slowly), but to pH, which is dependent upon plasma carbon dioxide levels.In other words, CO2 is the driving force for breathing. The receptors in the aorta and the carotid sinus initiate a reflex that immediately stimulates breathing rate and the receptors in the medulla stimulate a sustained increase in breathing until blood pH returns to normal.This response can be experienced by running a 100-meter dash. During this exertion (or any other sustained exercise) your muscle cells must metabolize ATP at a much faster rate than usual, and thus will produce much higher quantities of CO2. The blood pH drops as CO2 levels increase, and you will involuntarily increase breathing rate very soon after beginning the sprint. You will continue to breathe heavily after the race, thus expelling more carbon dioxide, until pH has returned to normal. Metabolic acidosis therefore is acutely corrected by respiratory compensation (hyperventilation).Regulation of Blood pHMany of us are not aware of the importance of maintaining the acid/base balance of our blood.It is vital to our survival. Normal blood pH is set at 7.4, which is slightly alkaline or "basic". If the pH of our blood drops below 7.2 or rises above 7.6 then very soon our brains would cease functioning normally and we would be in big trouble. Blood pH levels below 6.9 or above 7.9are usually fatal if they last for more than a short time. Another wonder of our amazing bodies is the ability to cope with every pH change – large or small. There are three factors in this process: the lungs, the kidneys andbuffers.So what exactly is pH? pH is the concentrationof hydrogen ions (H+). Buffers are molecules which take in or release ions in order to maintainthe H+ ion concentration at a certain level. When blood pH is too low and the blood becomes too acidic (acidosis), the presence of too many H+ ions is to blame. Buffers help to soakup those extra H+ ions. On the other hand, the lack of H+ ions causes the blood to be too basic (alkalosis). In this situation, buffers release H+ions. 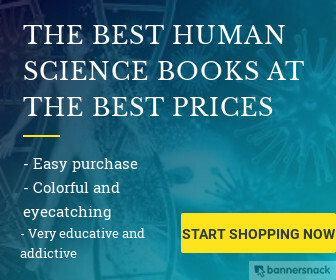 Buffers function to maintain the pH of our blood by either donating or grabbing H+ ions as necessary to keep the number of H+ ions floating around the blood at just the right amount.The most important buffer we have in our bodies is a mixture of carbon dioxide (CO2) and bicarbonate ion (HCO3). CO2 forms carbonic acid (H2CO3) when it dissolves in water and acts as an acid giving up hydrogen ions (H+) when needed. HCO3 is a base and soaks up hydrogen ions (H+) when there are too many of them. In a nutshell, blood pH is determined by a balance between bicarbonate and carbon dioxide.Bicarbonate Buffer System. With this important system our bodies maintain homeostasis. (Note that H2CO3 is Carbonic Acid and HCO3 is Bicarbonate)CO2 + H2O <---> H2CO3 <---> (H+) + HCO3*.If pH is too high, carbonic acid will donate hydrogen ions (H+) and pH will drop. *.If pH is too low, bicarbonate will bond with hydrogen ions (H+) and pH will rise.Too much CO2 or too little HCO3 in the blood will cause acidosis. The CO2 level is increased when hypoventilation or slow breathing occurs, such as if you have emphysema or pneumonia. Bicarbonate will be lowered by ketoacidosis, a condition caused by excess fat metabolism (diabetes mellitus).Too much HCO3 or too little CO2 in the blood will cause alkalosis. This condition is lesscommon than acidosis. CO2 can be lowered by hyperventilation.So, in summary, if you are going into respiratoryacidosis the above equation will move to the right. The body's H+ and CO2 levels will rise and the pH will drop. To counteract this the body will breathe more and release H+. In contrast, if you are going into respiratory alkalosis the equation will move to the left. Thebody's H+ and CO2 levels will fall and the pH will rise. So the body will try to breathe lessto release HCO3. You can think of it like a leak in a pipe: where ever there is a leak, the body will "fill the hole"